A very successful Open Day. Last Wednesday saw 78 players contest a 4BBB stableford competition. The course was magnificent again and everyone complimentary of the conditions. The youthful pairing of Robert Eriksson and Nick Reinhard came to the fore and won the day with a combined score of 46 points. Hard on their heels, Dennis Cooper and Chris Harvey survived a count back to claim the runners-up award. Not to be outdone on the day, Langdon Emery cleaned up on the pro-pin 14th and walked away with the jackpot amount from the previous week as well. We welcomed several visitors from Jamberoo and Caboolture, and all were impressed with the day. Easter Saturday 3 person Ambrose. The Clayton clan of Ray, Will and Nick Penhall held off a tight challenge from the Mulholland mob of John, Alex and Sam to win by the barest of margins. Only 1/6 of a stroke separated the groups at the end with scores of 57 1/6, to 57 1/3. Even an amazing 61 gross by the Mulholland team wasn't enough on the day. Great competition everyone. The shorter tee positions on the 4th and 18th were well received, and it was interesting to see the number of tee shots that ended up in the creek on the final hole. The final pairing for the Arthur Brassey was determined on saturday when Alec Dietsch defeated Nick Reinhard on the 20th hole. Alec has accounted for Dave Burgess, John Buchanan, and Peter Metcalf on his way to the final where he will meet John McGuire. John defeated Phil Jeffery, Brian Hanrahan, Tony Rourke and Co Buisman in his journey to the final. The match will be played next Sunday 28th, with a tee time of 12:30. Why not come along and give the finalists some encouragement on the day. ​Friday 26th April sees the opening of the winter version of the afternoon 12 hole competition. Grant Blanchard and Ashley Southon will administer the competition again. A $20 competition fee will cover entry for the entire 22 week event, and a daily $5 fee will cover the round and a ball rundown. Tee off is from 1pm. Bruce Smith Cup. This event is just around the corner and I still need more players to sign up. The event will be played at Moss Vale golf club on May 5th commencing at 10:50. The format is a team event with each match played in pairs with an aggregate stableford score determining the winner. We won last year by quite a margin, and I'd like to be able to repeat the dose if possible, so please sign up by 26th April. Mixed Foursomes Club Championships, and the Mixed handicap competition (Wotton trophy). These two events are played simultaneously over two rounds. Round 1 on 19th and round 2 on 26th May. There will be a daily event in conjunction, so a competition fee is payable on both days. Note that the ladies will tee off the first hole on round 1, with the men teeing off on round 2. If there are any players who do not have a partner, there will be a signup sheet in the pro-shop to allow singles to pair-up. J W Draper. A match play handicap Foursomes knockout event. The sign-up sheet will be at the pro-shop from Wednesday this week. See the calendar for scheduled completion dates. Patrons Trophy. This event is also the qualifying round for the Club Foursomes Championship, best 8 teams to qualify. The qualifying round is off scratch, while the Patrons trophy is a handicap event. Note that the only competition on the day is foursomes. Get your teams organised. "The man who takes up golf to get his mind off work soon takes up work to get his mind off golf......"
Thats all from me this week, now go and enjoy your golf. Martin Flaxman wins his first Trophy. A past Club Captain damages the decoy. Ash Southon, with a Gross of 57 and Nett (6.5) 50.5 cleaned up the awards. An awesome return and well deserved. Gross score runner-up was Brian Hanrahan with 61 on a count back, while Terry Downing (9.5) returned a score of 52.5 to claim the nett runner-up award. Congratulations to everyone who competed over the season. The Winter Eclectic competition has begun, and the sign-up sheet is at the Pro-shop. Bob Young (24) claimed the stableford midweek competition with 40 points from Chris Kunz (17) on 39. A good field of 77 players enjoyed the continuing excellent weather and course conditions. The DSR of 70 indicated that the course still had its teeth bared. The Pro-pin was not correctly written up, so $125.00 jackpots to next Wednesday's competition. Martin Flaxman (23) survived a count back to narrowly edge out Paul Carroll (16) and claim his first ever trophy win with a score of 41 points. Martin, a morning player, demonstrating his enthusiasm for the trophy by returning for the presentation in the afternoon. Well played. I was pleased to hear the positive comments made by players about playing the 10th and 14th from a different tee location. Players will get the full experience of all our tee locations throughout the course of the year. On a more sombre note, the Owl who has taken to hanging around overhead the 15th tee was mercilessly clubbed by an ex Captain of the BGC. Ask him to relate the full story next time you catch him in the bar. It's a hilarious tale that begins with the Owl and continues with 'lost balls', 'incorrect balls played' and general mayhem over next two holes. John Buchanan has kindly agreed to establish a referees list, and will be my 'go to' when I need a rules discussion and to provide referees for the various competition events as required. If any members feel they have a reasonable grasp of the rules, and would like to have their name added to the list, please either send your name and contact details to myself or John. At an appropriate time we may be able to run some 'rules' discussion events. A reminder regarding the correct dropping technique. The new procedure for dropping a ball into play was changed as of 01 January 2019. The ball is dropped from knee height, not from shoulder height as was the previous technique. 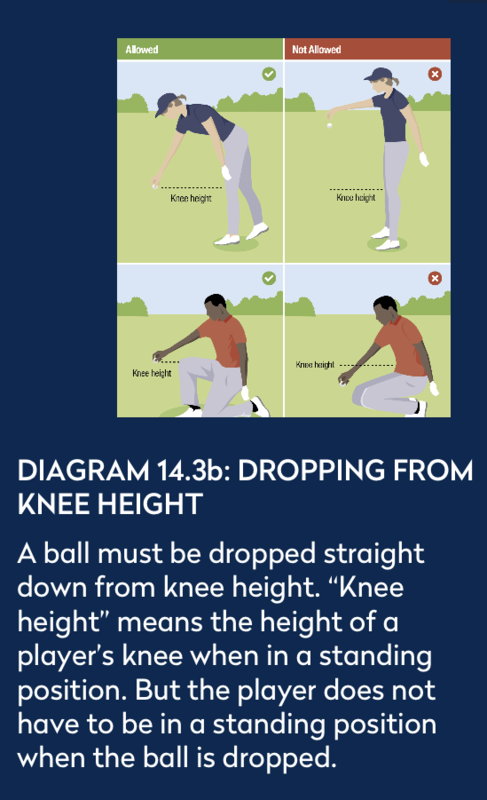 If you drop the ball incorrectly, you are not penalised if you re-drop the ball in the correct way, however if you don't correct for the incorrect drop a penalty applies (Rule 14.3b). See the diagram. Wednesday 17th is an open day with a 4BBB competition scheduled. Saturday 20th (Easter Saturday) is a 3 person Ambrose event, and a couple of different tee locations await. Should be some fun. The final of the Arthur Brassey matchplay handicap knockout will be held on 28th April. Tee time yet to be determined, but I'll advertise the time when available. Come and watch the guys battle for the trophy. ANZAC Day Medley April 25th. 12 Hole shotgun start. Tee off at 1pm. Please note that the club will be closed until 12 o"clock. Format will be advised on the day. The Foursomes season is about to begin. Get your partner ready, sort out your tactics. Sign up sheets will begin appearing shortly. Bruce Smith Cup. Sunday May 5th at Moss Vale GC. A reminder to add you name to the sign up sheet in the Pro-shop. We need more players and Moss Vale is waiting to exact its revenge. Let's not let that happen. The clubhouse will be closed on Easter Friday and Sunday. The course will remain open. ANZAC Day BBQ following the medley competition. Booking at the bar please. $22.50 per head. Sunday Sessions Jazz April 28 and May 12th. Trivia night with Geoff Hammond May 17th. Golfer "I think I'm going to drown myself in the lake". Until next week, go and enjoy some good golf. As I begin my first Blog, I am very aware of the road which lies ahead. My predecessors, in my opinion, have led Bowral Golf Club into becoming the finest complete golf club in the Southern Highlands. I wish to acknowledge the fine contributions made by David Stanley during the past year. He gave a great sense of dignity and pride to the role of Captain, and I wish him well as he endeavours to reduce his handicap, now the pressure is off. If you cast your eyes over the view from the club house or from the first tee, you get a sense of the very high standard of course presentation. We get to play and enjoy this course every week, and I for one wish to acknowledge Damian Gair and his staff for their dedication and fine work. I will continue to drive golf at our club into the future, but will do so whilst being mindful of the history and traditional values which have formed the club thus far. I believe my role is to represent the game for all our golfers, not just a select few. I don't rush to decisions and I'm not averse to change if I consider the change will benefit golf at our club. A Grade. John Buchanan (15) nett 70. B Grade. Warren Ryan (21) nett 66. C Grade. Martin Flaxman (24) nett 66. Congratulations to the winners, it was an honour to present a past club captain (Pennant Hills GC) with my first medal presentation as BGC Captain. A fabulous day of golf, but as the DCR of 71 indicates, not an easy round. Only 3 players returned a sub par nett result. The Sunday morning mist lifted early enough to ensure the field of 66 players were treated to a course in magnificent condition. As the players from the medal competition the previous day can attest, the course played hard. The eventual winner, Thomas Holz from Lincs Shell Cove was the only player to record a sub par round (both gross 66, and nett 67). This score equals the course record. Clark Gibbons was the best placed BGC entrant with a very creditable equal 7th place returning a nett 73. Congratulations to everyone involved in the day, players and organisers alike. The Bruce Smith Cup. It's our men's competition against Moss Vale GC. We won it handsomely last year, and I'd like to continue that trend, so sign up early! The competition will be held at MVGC on 5th May, with tee times starting at 10:50. The signup sheet will be in the pro shop by Wednesday 10th April, entries close 24th April. Next Open Day. Wednesday 17th April. Foursomes Competitions. The next two months are characterised by various foursome events. The signup sheets will shortly appear in the pro shop for the J W Draper, The Mixed Foursomes Championships (off scratch) and the Mixed Foursomes (handicap) Wotton Trophy events. The mens Club Foursomes Championship qualifying will be held in conjunction with the Patrons trophy event on May 11th. Best 8 scratch scores to qualify. Check the calendar for completion dates. Please note that the competition on the Patrons day is only a foursomes event, so sign up as a 4 please. Easter. The clubhouse will be closed on Good Friday and Easter Sunday. ANZAC Day. There is a 12 hole medley competition scheduled for Anzac day, with a 1 pm tee off and a BBQ to follow. The clubhouse will be closed until 12:00. Thought of the week. "Golf is serious, life's not"
That ends this missive. Until next week, get out and enjoy some great golf. After a slow start due to some logistical problems our Friday 12 hole medley competition under the stewardship of Grant Blanchard and Ashley Southon finished on a high note. My thanks to both Grant and Ashley for taking on this task.The free sausage sizzle at the end of play for all was an added attraction. ​Here is their summation of the season. The competition was held over 20 weeks - 10 weeks prior to Christmas and 10 post Christmas. The number of players was down on previous years but the enthusiasm for the competition was just as keen as ever and the lead see sawed back and forward and was decided only over the last 3 games. The saying goes that 'winners are grinners' and it is true in this photo. competition and attended the final presentation. The new mound on the 18th has been seeded and fertilised. With the weather we are experiencing at the moment this should start to green up very quickly. A quote has been received to fix our ailing bobcat. Once this has been carried out work can continue to complete the mounding around the 6th green and finishing off the extension of the 4th fairway. Dad's Army continues their good work rejuvenating the gardens at the front of the club house. St. Andrews and Augusta have their bridges and we have our picturesque and elegant sandstone bridge. The comparison with great courses of the world continues.